Our Installation and User Guides are comprehensive manuals. The fonts are BIG and we have lots of pictures and arrows to show you where everything goes. 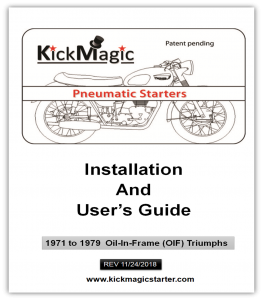 The step-by-step instructions have been vetted by a number of our most picky vintage bike colleagues in an attempt to not only be clear about how the system is installed, but also to point out issues that you may find with your bike. A video overview of prepping your bike, installing and using the system can be found HERE. The printed manual that ships with your kit will be current as of that date, but we update the online versions anytime we feel we can improve them.